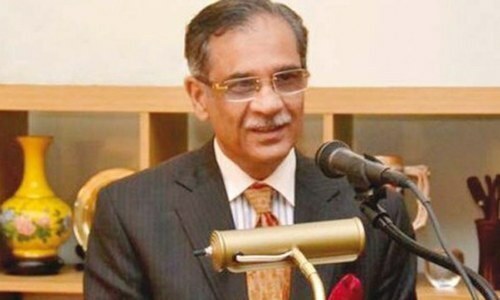 Following growing complaints about lack of facilities at public hospitals in Lahore, Chief Justice of Pakistan (CJP) Mian Saqib Nisar on Thursday took a suo motu notice of the hospitals’ conditions. The superintendents were ordered to appear before the SC’s Lahore registry on Saturday with reports containing details of emergency equipment, CT Scan, MRI and ambulances etc. The report should also explain the availability of life-saving drugs at the hospitals, and the medicines that are being provided to the patients free of cost and those that have to be purchased from outside, a notice issued by the SC’s deputy registrar said. “There has been much hue and cry from the public complaining [about] the non-availability of even life-saving drugs and non-functional emergency equipment,” the document read. Outlining the SC’s agenda for 2018, Justice Nisar on Wednesday had said that the court would be focusing on human rights issues, particularly those relating to the people’s right to quality education and healthcare. The SC is already hearing cases regarding provision of clean water in Sindh and Punjab as well as one regarding high fees in Punjab’s medical colleges.